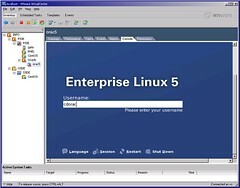 VMware Virtual Center 1.4.1 and VMware Server 1.0.4 on IBM PIII Thinkpads ! They said it wasn’t possible ! 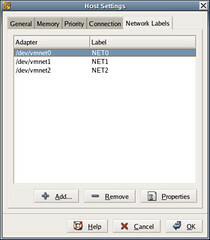 NOTE You must set up network labels on VMware Server before you try and add a new VM using VC (to prevent getting the “VMware VirtualCenter cannot create a virtual NIC until physical networks have been labelled for this server” error ! This entry was posted in vizz on 30/10/2007 by osde8info. This entry was posted in vizz and tagged vmware on 30/10/2007 by osde8info. This entry was posted in vizz and tagged xen on 29/10/2007 by osde8info. Don’t be put off by the VMWVC min spec of P4 & 2G RAM – it works (for demo/eval purposes) on a PIII with only 256M RAM ! This entry was posted in vizz and tagged vmware on 29/10/2007 by osde8info. “VMware isinstalled, but it has not been (correctly) configured for this system. This entry was posted in vizz on 28/10/2007 by osde8info. 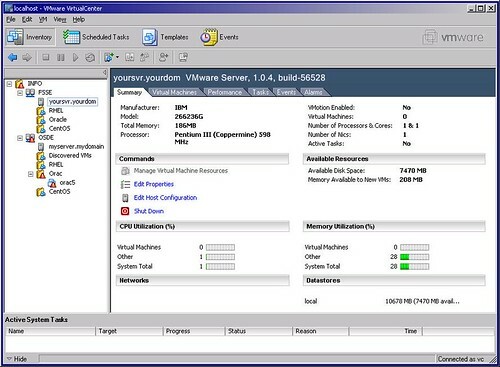 A minimum of 2GB RAM for VirtualCenter configurations managing 50 managed hosts or fewer. For greater than 50 managed hosts configurations, use 3GB RAM. For configurations with 100 managed hosts running 2000 virtual machines, use 4GB RAM. recommended for deployments with more than 25 managed hosts. Disk space sufficient on the machine to support the VirtualCenter database and the template upload directory. I wonder how much “sufficient” is ? This entry was posted in vizz on 26/10/2007 by osde8info.